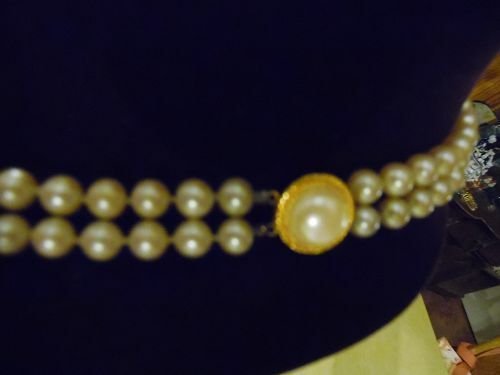 Very nice double strand pearl necklace with matching bracelet. 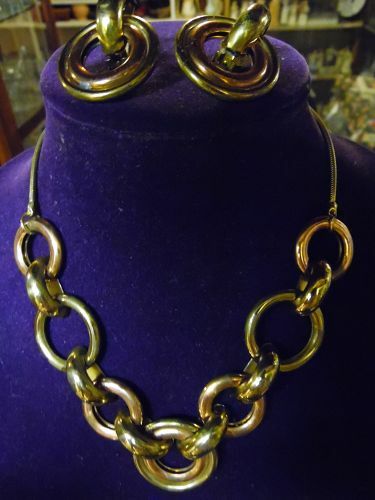 Fancy matching clasps on each. Very heavy like real pearls, beautiful irridescent sheen like real pearls and is knotted between each pearl. I am not knowledgeable about pearls so maybe this is what they call cultured pearls. But hard to tell these from real ones. 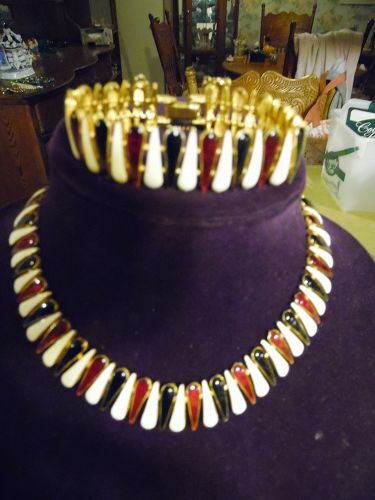 Necklace 22" long, Bracelet is 8". Beautiful condition. 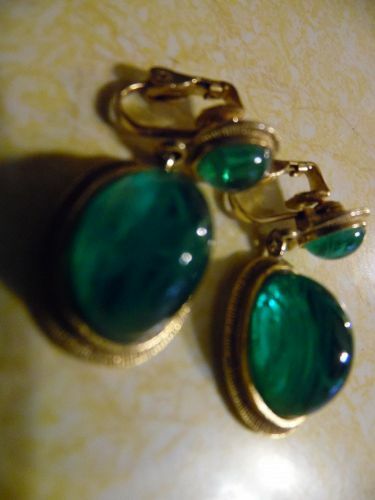 Pretty and elegant green jelly belly cabochons set in gold tone. Clip backs Marked Weiss. Beautiful condition. Measures 1 1/2 long. 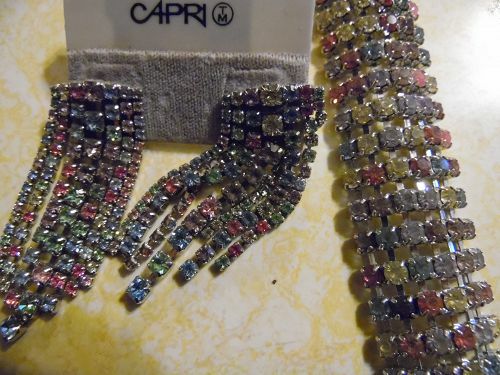 Pretty 1" wide rhinestone bracelet with a pair of cascading earrings that has post backs and hangs 2 1/2" long. Composed of pale pink, clear and pale blue crystal rhinestones that are all prong set in silver tone. Bracelet 1" wide and 7 1/2" long plus the clasp. (1 stone appears darker). 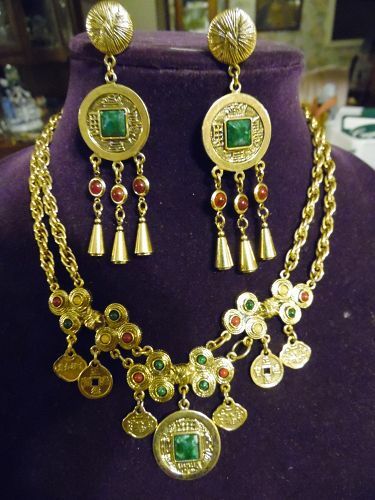 The earrings are on a CAPRI brand card. Not sure if this is the original card or not, but if it is.. earrings was purchased at Bullocks for 27.50 according to the tag. Post backings. 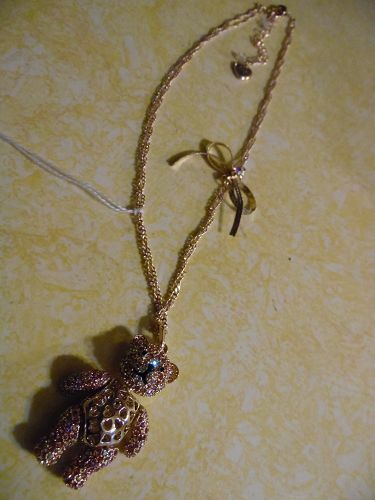 BETSEY JOHNSON long pendant necklace with uniquely adorable pavé bear and bow is created in rose gold-tone mixed metal. Approximate length: 19" + 3" extender. Approximate drop: 1-3/4". Lobster clasp closure. Head,arms,legs all move. 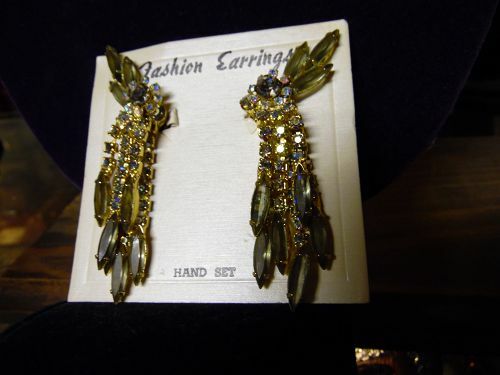 By Betsey Johnson. Imported. Approximate measurements: Length: 19" + 3" extender, 1 3/4" drop. Worn once. Whoops photo has backside showing. Front side is entirely covered in pave stones like the rest of the bear. 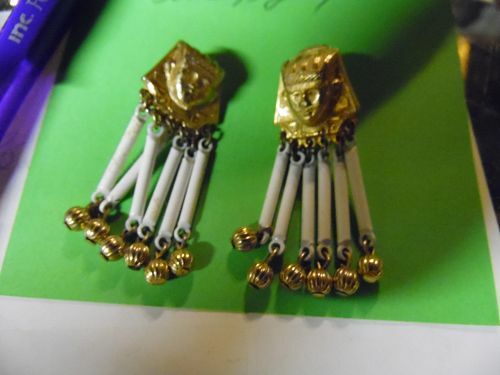 Wonderful well made pair of clip earrings with A Egyptian King or Pharoh and long swingy beads that hang from the bottom of each earring. Appears to have never been worn. 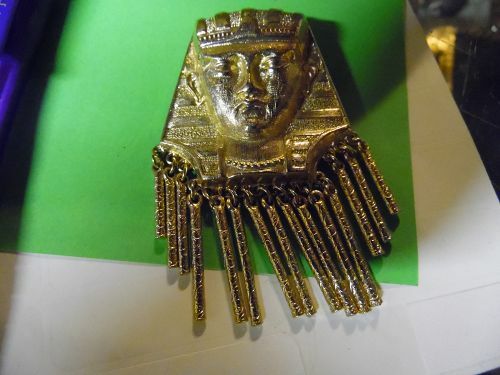 This may be King Tut, not sure but does have an Egypt theme. No makers mark but nicely made and has clip backs. Measures 1 7/8" from top to bottom over all. 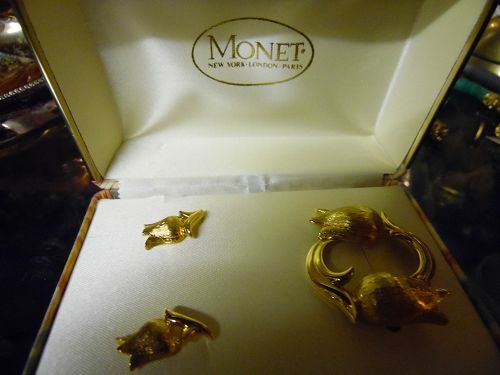 I have an awesome pin listed that would compliment these nicely. 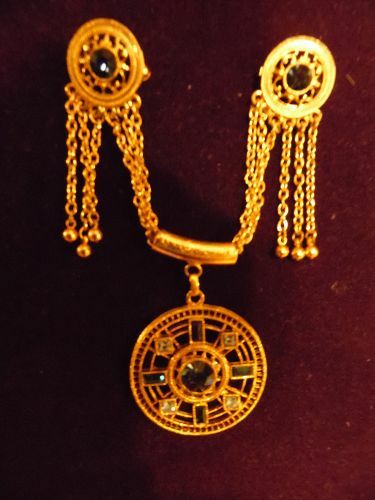 A wonderful well made heavy gold tone Egyptian Pharoh pin with bottom row of long gold filigree beads. Maybe this is King Tut or just another King from Egypt. Pin measures 2 5/8" from top to the bottom of the longest bead. Excellent condition, with no flaking or damages. Pin back works well.No makers marks. 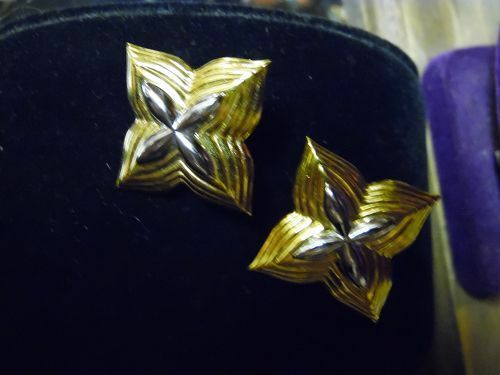 I will be listing some earrings that would accessorize well with this pin.